Today on my blog I am going to give you a run down of my favorite books from the past year as well as a list of books I can’t wait to read in the year ahead. This is my second post of recommendations for the year. You can check out a few other titles I shared in my Summer Reading Round Up, here. Anna Kendrick is a small-statured person. Anna is a woman who has had big dreams all her life. Anna is a woman who, in direct relation to the amount of work she has put in, is becoming wildly successful in her industry. Because I relate to Anna on many of the aforementioned qualities (I’m still holding out for the wildly successful part! ), and because I love her movies, I read this book. I was rewarded with delightfully witty banter, stories from her childhood and an insider’s scoop into Hollywood (for example, apparently Zac Efron is the nicest human being on the planet and deserves all the good that comes his way). Anna covers childhood auditions, her dating life, the making of famous movies and more, all told in her trademark sarcasm. I listened to the audiobook version of this memoir and I often had to pause while walking during my lunch hour to simply stand there and laugh… in the middle of the sidewalk. Now tell me you couldn’t use some of that! I wrote all about my love of, okay my obsession with, this book back in October. Seriously, I was addicted to this story about three smart, sassy and compassionate women who figured out a way to claw out of the mess they were plopped into. If you need to know more than that this book was funny, engaging and brutally honest about the ways of women, click here to read my full review. I don’t typically read a lot of nonfiction, but here I am, listing another memoir in my 2018 favorites. (I actually picked up this book because the author of the previous title mentioned it on social media.) Beck Dorey-Stine was one of President Obama’s stenographers. What in the world is a stenographer? A stenographer is a person who transcribes speech. As an official White House stenographer, it was Beck’s job to transcribe the president’s speeches, interviews, meetings and other verbal interactions so that his words could be recorded and kept for posterity’s sake in the presidential archives, and also be accurately distributed to news outlets. Beck’s memoir is part work hard, play hard/millennial diary and part inside peek into the life of our 44th president. Topics covered include the Oval Office, family vacations in Hawaii, international trips to meet with foreign leaders, pre-elections rallies and post tragedy family meet and greets. This book was insightful, indulgent and incredibly passionate. Beck’s honest appraisal and sheer love of one of our nation’s leaders was a joy to read. It also increased my knowledge of American government in a way that I, a former social studies minor, very much appreciated. This book was pure entertainment wrapped in bright, shiny 1980’s packaging. A future United States is gripped in an 80’s themed video game quest to win a late computer programmer’s billion-dollar fortune. His will and testament claims that a single gamer, able to complete all of the challenges he has laid out, will win not only fame and fortune, but also control of his company, the BIGGEST company in the nation. A true underdog story, with the most fantastic world building I’ve read since Harry Potter, grabbed me from page one and refused to let me go until the end. If you are interested and want to know more about this book, I wrote a letter to the author and posted it here. If you love pop culture or science fiction or video games or the 80’s or Cinderella stories or are just plain looking to be entertained… then this book might be for you. My favorite genre of books are ones that combine historical fiction with romance and a touch of the supernatural. Author Susanna Kearsley is a pro in this field. I’ve read several books by her, but I think the one I read this year, Firebird, is her best. A psychic woman has tried to suppress her “gift of sight” because of the way it makes her look to others… abnormal, an outsider. But when a dying woman needs her help to verify the first owner of a family heirloom, she takes one step, then another and another into a century crossing quest to find the truth. Her ex-boyfriend, also a psychic, is along for the ride, making the twist and turns even more delicious. This book was not only enjoyable as a reader, but inspirational as a writer. I used the authors words and techniques to do some writing of my own, which you can see here. My favorite middle grade title of the year was One for the Murphy’s. This story is a fictional, heart breaking and honest look at the foster care system. In my opinion it is a must read for every teacher and any person interested in becoming a foster parent. I read it out loud to my 7th grade students, who on most days could use an additional dose of empathy. This book was it. Chaotic on most days, my students willingly and silently settled in to hear about Carley and her dual vision of the world… the one with her mother and the one with her foster family, the Murphy’s. A quick read. A good read. A must read. *Arriving to my home, my bookshelf and my personal reading line up! 2019 is off and running and I had better get going because my reading list is long! One of my New Year’s Resolutions was to read more in the upcoming year. Often, I spend my spare moments writing or catching up on one of the umpteen tasks related to being an authorpreneur and thus, I’ve spent far less time reading in the past few years than I’d like. I’m going to make a concentrated effort to change that this year. The books on the list comprise a wide range of titles, encompassing many genres and many targeted age ranges. I think this list adequately portrays my own divided interests in writing for a wide range of audiences myself and also proves that the mind is a fascinating entity comprised of many different curiosities. This year Miranda Paul is accomplishing an incredible feat. She is publishing FOUR books in one year and I can’t wait to own each and every one of them. Nine Months is a “pregnancy book unlike any other one out there, watch what's actually happening through meticulously detailed, actual size illustrations, perfectly paired with a lyrical yet informative text, and culminating in a warm, joyful birth scene.” I am super excited about this book because I plan to get it for my husband to share in his middle school health classroom. Miranda will also release, I Am Farmer, a book she wrote with her husband, Baptiste Paul, that chronicles the story of Farmer Tantoh’s efforts to bring clean water and beautiful gardens to people in his country of Cameroon (Africa). Her third book to release (in September) will be Little Libraries Big Heroes, which tells the history of Little Free Libraries and their beloved creator Todd Bol. And last but not least, Speak Up, will round out her epic publishing year. Congrats Miranda and thank you for the gift of your words and stories you share! So, I will confess that I’ve actually owned this book, the third and final installment in a series, for quite some time. It has been sitting, lonely and unread on my shelf, probably because it is purely a pleasure read and other tasks, books, and learning opportunities have seemed more pressing. BUT, come March, when the chaos of my book launch and accompanying book events have come and gone, I am going to read it. I LOVED the first two in a series that could be described as new adult magical realism. (AKA: a book for people older than teens about magical stuff that happens within our real world setting.) It has a flawed, BA female protagonist, an inventive plot and a raw edge that will force you to question and wonder and most importantly read on. I am very much looking forward to finding out the final fate of the Tearling. This book has been getting a lot of buzz in the children’s lit world. I first heard about it in a Publisher’s Weekly podcast, KidCast, and then it came up again in Colby Sharp’s eNewsletter. He did a great job of talking about this book, so I’m gonna let him take this one. This book might not appeal to everyone, but as a word nerd I can’t wait to dig in. Anthropologists, Philosophy majors and biologists might also see the appeal. The blurb of the book says, “He (the author) argues that stories help us navigate life's complex social problems--just as flight simulators prepare pilots for difficult situations. Storytelling has evolved, like other behaviors, to ensure our survival. Drawing on the latest research in neuroscience, psychology, and evolutionary biology, Gottschall tells us what it means to be a storytelling animal and explains how stories can change the world for the better.” As an author, creating stories that can change the world for the better sounds like a darn good aspiration. I’m hoping I can learn a lot from Jonathan and then turn around and put that knowledge to good use ASAP. The Girl Who Drank the Moon, Montaigne In Barn Boots, and The Lost City of the Monkey Gods are also on my list. What are you hoping to read this year? What’s on the top of your book pile? What author’s upcoming release are you craving? 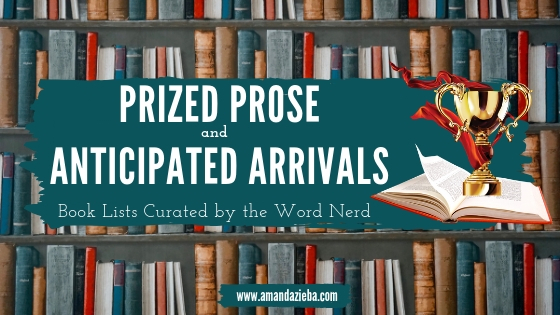 Tell me all about your prized prose and anticipated arrivals in the comments below. And the, I’ll see you back here next week for the next installment of Writing Wednesday.